Jakarta. President Joko "Jokowi" Widodo inaugurated on Sunday the first phase of the Jakarta Mass Rapid Transit – vital infrastructure expected to reduce some of the world's worst traffic congestion. The 16-kilometer transit line, built at a cost of Rp 16 trillion ($1.1 billion) funded through a soft loan from the Japan International Cooperation Agency, connects Lebak Bulus in South Jakarta to the Hotel Indonesia traffic circle in the downtown area of the capital. The Jakarta MRT is served by 16 six-car trainsets that can transport a total of up to 130,000 passengers per day. There are 13 stations along the 16 km route, which takes 30 minutes to complete. "Today marks a new era we will have with the first phase of the MRT being operational," Jokowi said in his keynote address. The event served as a perfect showcase for the achievements of the incumbent president, who is seeking a second term in next month's elections. 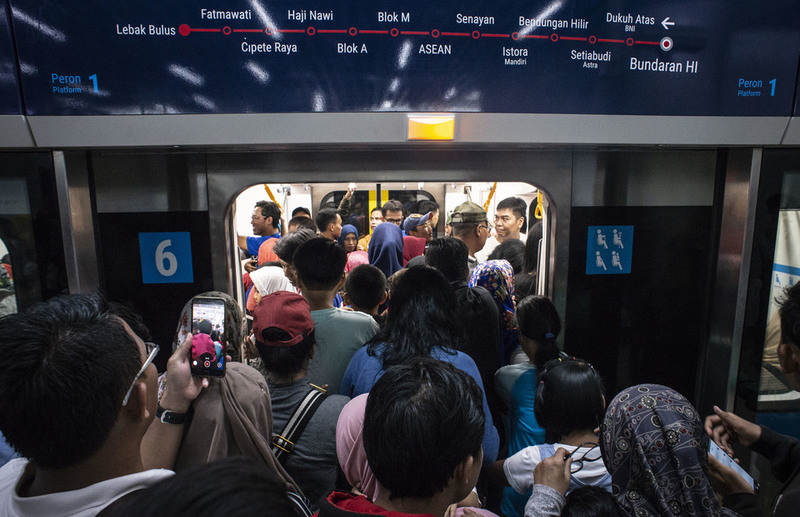 Tens of thousands of excited Jakarta residents flocked to the area, eager to take a ride on the subway for the first time. Many also mobbed the president for "wefies," to post on social media. 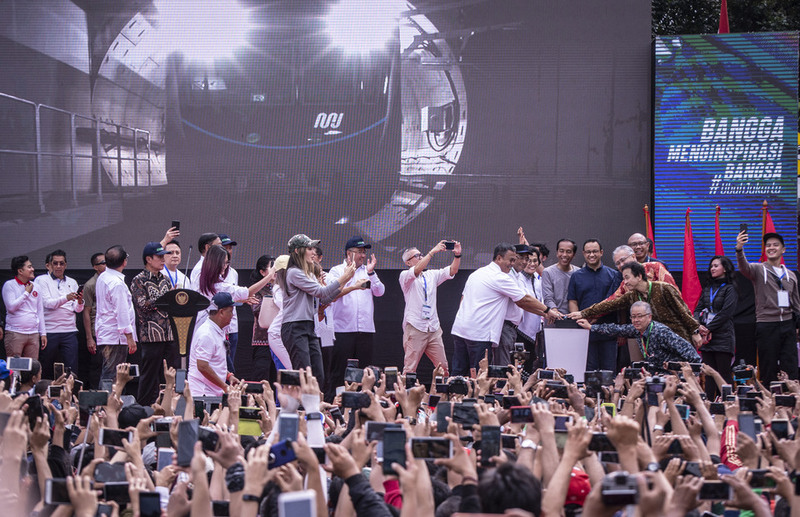 In his down-to-earth speaking style and in a heavy Javanese accent, Jokowi jokingly asked those in the crowd who had already tried out the MRT to raise their hands. "For those who haven't, you must try again tomorrow; it is still free," he added amid laughter from the people in the crowd, who responded by raising their index fingers – a symbol of support for Jokowi, referring to his number on the ballot. Indonesians commonly raise one finger when asked to raise their hands. The president also reminded passengers to adopt a proper habit of queuing and to assist the operator to maintain the cleanliness of the facility. "Be patient and make sure you follow the queue. Don't jostle with each other. Be disciplined, by making sure you know the schedule. Don't let yourself get stuck in the door when the doors close," he said in a joking tone. In an earlier event where thousands of entrepreneurs publicly declared their support for Jokowi's candidacy, he cited data from the National Development Planning Agency (Bappenas) showing that the traffic congestion costs the greater Jakarta area an estimated Rp 65 trillion per year, mainly in lost productivity and wasted fuel. He added that this figure could go up to Rp 100 trillion. "Do we want to continue like that? It is better if that money is spent on building the MRT and light rail transit system," he said. The president added that the most recent government estimate showed that it would cost Rp 571 trillion for the entire Jakarta MRT, which will span 231 km. Jakarta Governor Anies Baswedan said the MRT tariffs will be announced on Monday, and that it would operate on a progressive system, meaning fares will be based on the distance of the journey. He said this would likely be about Rp 10,000 per station, on average. During the inauguration, Jokowi also announced the start of construction of the second phase of the MRT. The Sarinah-Kota line will be 7.8 km long and have seven underground stations: Sarinah, Monas, Harmoni, Sawah Besar, Mangga Besar, Glodok and Kota.